Thought it would be fun to post the two dishes I cooked on the Expresso Breakfast TV Show this week. You can also see the videos on YouTube, click here. First off was a Mexican Tortilla Soup with Chicken and Corn, we had Hugh Masekela in the studio – he was very amusing and referred to the soups as “pap pancakes soup”! In a deep ovenproof casserole, heat a thin layer of the olive oil over medium heat. Add the onions and garlic and fry for about 3 minutes, or until softened and just beginning to color. Add tortillas, chiles, and spices and stir fry for a while until the fragance from the spice starts coming off. Add the tomatoes with any juice and the chicken stock and bring to a boil. Lower the heat and allow to simmer for about 5 minutes. Remove from heat and let it the soup cool for a while. Purée and strain in batches. Strain to catch any seeds or skins. Add the chicken breast and the corn kernels, heat through and add the cream and the cheese. Season to taste. 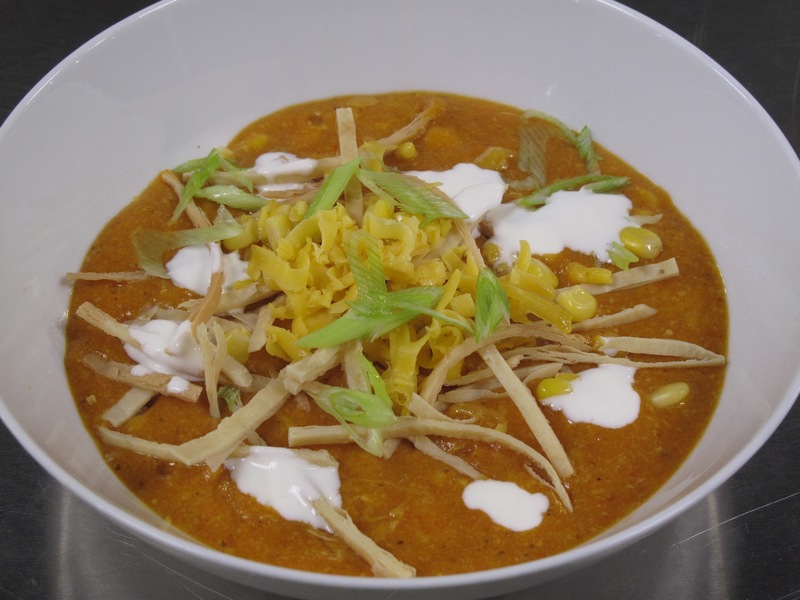 Serve in warm bowls garnished with the cream, tortillas and cheese and a wedge of lime on the side. 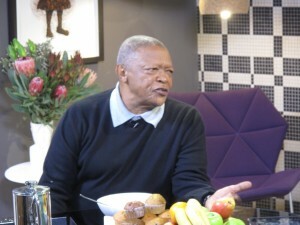 Hugh Masekela enjoying my papsop! Prepare the filling. Bring two saucepans of water [one for the asparagus and one for the pasta] to a boil and add salt. Have ready a medium bowl of ice water. Boil the asparagus tips until tender but still bright green, about 2 minutes. With a slotted spoon, transfer to the ice water. When cool, transfer with the slotted spoon to a small bowl and set aside. Cook and cool the asparagus spears in the same manner; dry them on paper towels. In a food processor chop 1½ 250ml cups of the spears very finely and transfer to a medium bowl. Add the remaining spears to the tips to use for the garnish later. To the chopped asparagus add the mascarpone, ricotta, Parmigiano, anchovies, garlic, and cayenne; mix well. Season well with sea salt and freshly milled black pepper. Heat the asparagus and cheese filling gently in a bowl over simmering water. Cook the pasta sheets in the boiling water following the instructions on the packet. Melt the butter for the garnish in a medium sized frying pan over medium heat and add the almonds. Cook shaking all the while until the butter turns light brown, about 6 minutes, and then immediately transfer to a small bowl to stop the browning process. 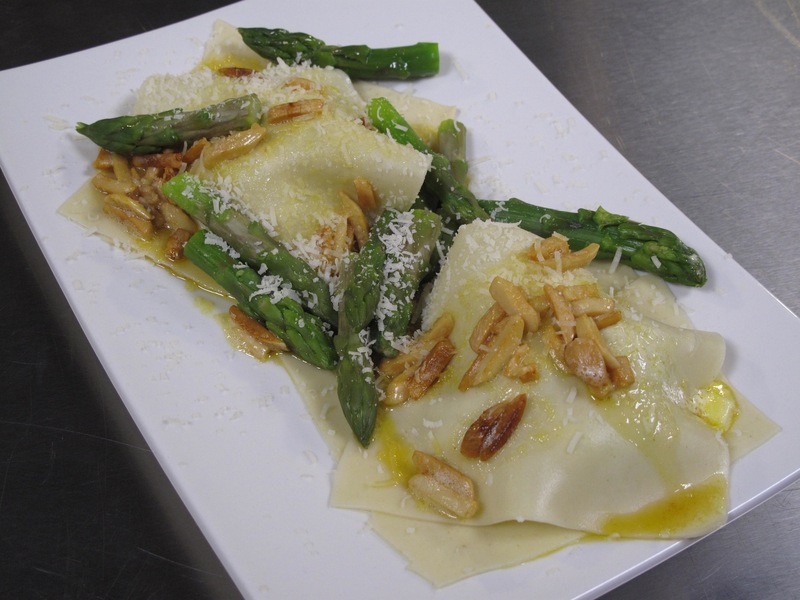 Place a sheet of cooked ravioli torn in half on the plate, top with a generous spoonful of the filling. Place a torn sheet on top and garnish with the asparagus spears. Spoon over the brown butter and almonds, a grind of pepper and some shaved Parmigiano and the lemon zest.